Every year on the day after the Birth of the Lord the liturgy has us celebrate the Feast of St Stephen, a deacon and the first martyr. The Book of the Acts of the Apostles presents him to us as a man full of grace and of the Holy Spirit (cf. Acts 6:8-10; 7:55). Jesus’ promise, recorded in today’s Gospel text, was fulfilled in him: believers called to bear witness in difficult and dangerous circumstances will not be abandoned or defenceless; the Spirit of God will speak through them (cf. Mt 10:20). Stephen the Deacon, in fact, worked, spoke and died motivated by the Holy Spirit, witnessing to the love of Christ even to the supreme sacrifice. The Protomartyr is described in his suffering as a perfect imitation of Christ, whose Passion is repeated even in the details. The whole of St Stephen’s life is shaped by God, conformed to Christ, whose Passion is replicated in him; in the final moment of death, on his knees he takes up the prayer of Jesus on the Cross, commending himself to the Lord (cf. Acts 7:59) and forgiving his enemies; “Lord, do not hold this sin against them” (v. 60). Filled with the Holy Spirit, when his eyes were about to be dimmed for ever, he fixed his gaze on “Jesus standing at the right hand of God” (v. 55), the Lord of all and who draws all beings to himself. On St Stephen’s Day we too are called to fix our eyes on the Son of God whom in the joyful atmosphere of Christmas we contemplate in the mystery of his Incarnation. Through Baptism and Confirmation, through the precious gift of faith nourished by the sacraments, especially the Eucharist, Jesus Christ has bound us to him and with the action of the Holy Spirit, wants to continue in us his work of salvation by which all things are redeemed, given value, uplifted and brought to completion. Letting ourselves be drawn by Christ, as St Stephen did, means opening our own life to the light that calls it, guides it and enables it to take the path of goodness, the path of a humanity according to God’s plan of love. Lastly, St Stephen is a model for all who wish to put themselves at the service of the new evangelisation. He shows that the newness of the proclamation does not consist primarily in the use of original methods or techniques — which of course, have their usefulness — but rather in being filled with the Holy Spirit and letting ourselves be guided by him. John the Baptist began his preaching under the Emperor Tiberius in about 27-28 A.D., and the unambiguous invitation he addressed to the people, who flocked to listen to him, was to prepare the way to welcome the Lord, to straighten the crooked paths of their lives through a radical conversion of heart (cf. Lk 3:4). However, John the Baptist did not limit himself to teaching repentance or conversion. Instead, in recognising Jesus as the “Lamb of God” who came to take away the sin of the world (Jn 1:29), he had the profound humility to hold up Jesus as the One sent by God, drawing back so that he might take the lead, and be heard and followed. As his last act the Baptist witnessed with his blood to faithfulness to God’s commandments, without giving in or withdrawing, carrying out his mission to the very end. In the 8th century the Venerable Bede says in one of his Homilies: “St John gave his life for [Christ]. He was not ordered to deny Jesus Christ, but was ordered to keep silent about the truth” (cf. Homily 23: CCL 122, 354). And he did not keep silent about the truth and thus died for Christ who is the Truth. Precisely for love of the truth he did not stoop to compromises and did not fear to address strong words to anyone who had strayed from God’s path. We see this great figure, this force in the Passion, in resistance to the powerful. We wonder: what gave birth to this life, to this interiority so strong, so upright, so consistent, spent so totally for God in preparing the way for Jesus? The answer is simple: it was born from the relationship with God, from prayer, which was the thread that guided him throughout his existence. John was the divine gift for which his parents Zechariah and Elizabeth had been praying for so many years (cf. Lk 1:13); a great gift, humanly impossible to hope for, because they were both advanced in years and Elizabeth was barren (cf. Lk 1:7); yet nothing is impossible to God (cf. Lk 1:36). The announcement of this birth happened precisely in the place of prayer, in the temple of Jerusalem, indeed it happened when Zechariah had the great privilege of entering the holiest place in the temple to offer incense to the Lord (cf. Lk 1:8-20). John the Baptist’s birth was also marked by prayer: the Benedictus, the hymn of joy, praise and thanksgiving which Zechariah raises to the Lord and which we recite every morning in Lauds, exalts God’s action in history and prophetically indicates the mission of their son John: to go before the Son of God made flesh to prepare his ways (cf. Lk 1:67-79). The entire existence of the Forerunner of Jesus was nourished by his relationship with God, particularly the period he spent in desert regions (cf. Lk 1:80). The desert regions are places of temptation but also where man acquires a sense of his own poverty because once deprived of material support and security, he understands that the only steadfast reference point is God himself. John the Baptist, however, is not only a man of prayer, in permanent contact with God, but also a guide in this relationship. The Evangelist Luke, recalling the prayer that Jesus taught his disciples, the Our Father, notes that the request was formulated by the disciples in these words: “Lord, teach us to pray, just as John taught his own disciples” (cf. Lk 11:1). Dear brothers and sisters, St John the Baptist reminds us too, Christians of this time, that with love for Christ, for his words and for the Truth, we cannot stoop to compromises. The Truth is Truth; there are no compromises. Christian life demands, so to speak, the “martyrdom” of daily fidelity to the Gospel, the courage, that is, to let Christ grow within us and let him be the One who guides our thought and our actions. However, this can happen in our life only if we have a solid relationship with God. Prayer is not time wasted, it does not take away time from our activities, even apostolic activities, but exactly the opposite is true: only if we are able to have a faithful, constant and trusting life of prayer will God himself give us the ability and strength to live happily and serenely, to surmount difficulties and to witness courageously to him. St John the Baptist, intercede for us, that we may be ever able to preserve the primacy of God in our life. Thank you. Image from Zakopane, Poland, MMB. 7 December: Not a pious pastime. I have been reading Abbot Erik Varden’s new book ‘The Shattering of Loneliness, on Christian Rememrance’, and will review it in the next few months. I wanted to share this insight as we come towards Christmas. It follows nicely from Pope Benedict’s ‘sober inebriation’ remark about music, which certainly sustained his spiritual life. On p129. The Spiritual Life is not, cannot be, a pious pastime. It is premised on a total surrender to the promise and demands of the Gospel. it bears the imprint of the Cross and is charged with the spirit of the risen Jesus. I’m sorry that the A-Z Tour of Britain has got a bit lost. Yesterday’s post about the local pilgrim must have scratched at the door of my conscience! I was looking for a photo for my piece on Truro in Cornwall when I came across this in a blog called ‘Ship of Fools’. It is part of a report by a mystery worshipper, describing the sermon s/he heard at Truro cathedral, given by the composer James Macmillan on 10/10/10. Forget my effort and read on! WT. 9 – James Macmillan is a Roman Catholic, a lay Dominican, a musician and composer of note, not a preacher by trade, but he spoke very well and he was talking about the subject that is his passion. It was a privilege to hear him (and his music!). He had been there to deliver a lecture the previous evening, but sadly I didn’t know that. He had, incidentally, composed some of the music used at services during the recent papal visit. The gospel reading was Luke 17:11-19 (Jesus heals ten lepers, instructing them to show themselves to the priests). The ten lepers had to show themselves to the priests because the priest could authorise their readmission to the society from which they had been ostracised. But one (a Samaritan, no less) comes back and gives thanks and praise to Jesus on the surface a useless thing to do but Jesus lets him know that it was the right thing to do and wonders why the other nine didn’t bother. The one who gave thanks was more concerned with praising God than with following the prescribed ritual for readmission. Giving praise may baffle the contemporary world because it is perceived to be useless, but when we raise our voices in song it is not about the consequences. The parting of the Red Sea is the prime event in the Old Testament and Jewish history, and out of it comes the Song of Moses. The Song of Songs is the ultimate love song. Sometimes words are not enough. It is love that moves us to sing. The psalms were sung in Old Testament times and the psalter is the original prayer book. Pope Benedict has called music “the sober inebriation of faith”. June 5: Saint Boniface by Pope Benedict, 2. Today is the Feast of Saint Boniface. This great Bishop did not omit to encourage the foundation of various male and female monasteries so that they would become like beacons, so as to radiate human and Christian culture and the faith in the territory. He summoned monks and nuns from the Benedictine monastic communities in his homeland who gave him a most effective and invaluable help in proclaiming the Gospel and in disseminating the humanities and the arts among the population. Indeed, he rightly considered that work for the Gospel must also be work for a true human culture. Above all the Monastery of Fulda founded in about 743 was the heart and centre of outreach of religious spirituality and culture: there the monks, in prayer, work and penance, strove to achieve holiness; there they trained in the study of the sacred and profane disciplines and prepared themselves for the proclamation of the Gospel in order to be missionaries. Thus it was to the credit of Boniface, of his monks and nuns – for women too had a very important role in this work of evangelization – that human culture, which is inseparable from faith and reveals its beauty, flourished. Although he was getting on in years (he was almost 80), he prepared himself for a new evangelizing mission: with about 50 monks he returned to Frisia where he had begun his work. Almost as a prediction of his imminent death, in alluding to the journey of life, he wrote to Bishop Lull, his disciple and successor in the see of Mainz: “I wish to bring to a conclusion the purpose of this journey; in no way can I renounce my desire to set out. The day of my end is near and the time of my death is approaching; having shed my mortal body, I shall rise to the eternal reward. May you, my dear son, ceaselessly call the people from the maze of error, complete the building of the Basilica of Fulda that has already been begun, and in it lay my body, worn out by the long years of life” (Willibald, Vita S. Bonifatii, ed. cit., p. 46). While he was beginning the celebration of Mass at Dokkum (in what today is northern Holland) on 5 June 754, he was assaulted by a band of pagans. Advancing with a serene expression he “forbade his followers from fighting saying, “cease, my sons, from fighting, give up warfare, for the witness of Scripture recommends that we do not give an eye for an eye but rather good for evil. Here is the long awaited day, the time of our end has now come; courage in the Lord! '” (ibid., pp. 49-50). These were his last words before he fell under the blows of his aggressors. The mortal remains of the Martyr Bishop were then taken to the Monastery of Fulda where they received a fitting burial. Centuries later, what message can we gather today from the teaching and marvelous activity of this great missionary and martyr? For those who approach Boniface, an initial fact stands out: the centrality of the word of God, lived and interpreted in the faith of the Church, a word that he lived, preached and witnessed to until he gave the supreme gift of himself in martyrdom. He was so passionate about the word of God that he felt the urgent need and duty to communicate it to others, even at his own personal risk. The second most important proof that emerges from the life of Boniface is his faithful communion with the Apostolic See, which was a firm and central reference point of his missionary work; he always preserved this communion as a rule of his mission and left it, as it were, as his will. Boniface also deserves our attention for a third characteristic: he encouraged the encounter between the Christian-Roman culture and the Germanic culture. Indeed, he knew that humanizing and evangelizing culture was an integral part of his mission as Bishop. In passing on the ancient patrimony of Christian values, he grafted on to the Germanic populations a new, more human lifestyle, thanks to which the inalienable rights of the person were more widely respected. As a true son of St Benedict, he was able to combine prayer and labour (manual and intellectual), pen and plough. Boniface’s courageous witness is an invitation to us all to welcome God’s word into our lives as an essential reference point, to love the Church passionately, to feel co-responsible for her future, to seek her unity around the Successor of Peter. At the same time, he reminds us that Christianity, by encouraging the dissemination of culture, furthers human progress. It is now up to us to be equal to such a prestigious patrimony and to make it fructify for the benefit of the generations to come. His ardent zeal for the Gospel never fails to impress me. At the age of 41 he left a beautiful and fruitful monastic life, the life of a monk and teacher, in order to proclaim the Gospel to the simple, to barbarians; once again, at the age of 80, he went to a region in which he foresaw his martyrdom. By comparing his ardent faith, his zeal for the Gospel, with our own often lukewarm and bureaucratized faith, we see what we must do and how to renew our faith, in order to give the precious pearl of the Gospel as a gift to our time. 25 May: Saint Bede of Northumbria and Europe. Pope Benedict XVI spoke about today’s saint at his General Audience of 18 February 2009. He touches on many of Pope Francis’s themes, so continuity continues! An appropriate message for Pentecost-tide. You can find Pope Benedict’s full text here. In his commentary on the Song of Songs, Bede says Christ the Bridegroom wants a hard-working Church, “weathered by the efforts of evangelisation”. There is a clear reference to the word in the Song of Songs (1: 5), where the bride says “Nigra sum sed formosa” (“I am very dark, but comely”) intent on tilling other fields or vineyards and in establishing among the new peoples “not a temporary hut but a permanent dwelling place”, in other words, intent on integrating the Gospel into their social fabric and cultural institutions. In this perspective the holy Doctor urges the faithful to be diligent in religious instruction, imitating those “insatiable crowds of the Gospel who did not even allow the Apostles time to take a mouthful”. He teaches them how to pray ceaselessly, “reproducing in life what they celebrate in the liturgy”, offering all their actions as a spiritual sacrifice in union with Christ. He explains to parents that in their small domestic circle too they can exercise “the priestly office as pastors and guides”, giving their children a Christian upbringing. He also affirms that he knows many of the faithful (men and women, married and single) “capable of irreproachable conduct who, if appropriately guided, will be able every day to receive Eucharistic communion” (Epist. ad Ecgberctum, ed. Plummer, p. 419). 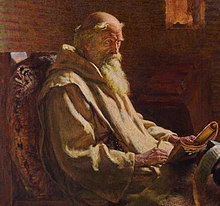 After his death, Bede’s writings were widely disseminated in his homeland and on the European continent. Bishop St Boniface, the great missionary of Germany, (d. 754), asked the Archbishop of York and the Abbot of Wearmouth several times to have some of his works transcribed and sent to him so that he and his companions might also enjoy the spiritual light that shone from them. It is a fact that with his works Bede made an effective contribution to building a Christian Europe in which the various peoples and cultures amalgamated with one another, thereby giving them a single physiognomy, inspired by the Christian faith. Let us pray that today too there may be figures of Bede’s stature, to keep the whole continent united; let us pray that we may all be willing to rediscover our common roots, in order to be builders of a profoundly human and authentically Christian Europe. 25 June: Shared Table VII, Lunch with Pope Benedict. It is a moving experience for me to be with you, to be with Jesus’ friends, because Jesus especially loves people who are suffering, people in difficulty, and wants them to become his brothers and sisters. Thank you for this possibility! I am very glad and I thank all those who prepared the meal, lovingly and competently I was truly aware of the good cooking, congratulations! and I also thank those who served the food. At lunch I heard of sorrowful events full of humanity and also stories of love rediscovered here at Sant’Egidio: the experiences of elderly, homeless or disabled people, emigrants, gypsies, individuals with financial problems or other difficulties who are all, in one way or another, sorely tried by life. I am here with you to tell you that I am close to you and love you, and that you and your affairs are not far from my thoughts but rather at the centre and in the heart of the Community of believers, hence also in my heart. With the words of St John Chrysostom I would like to remind each one: “Consider you have become a priest of Christ, giving with your own hand not flesh but bread, and not Blood, but a cup of water” (Homily on the Gospel of Matthew, 42,3). What riches are offered to life by God’s love expressed in real service to our brothers and sisters who are in need! Like St Lawrence, a Deacon of the Church of Rome, when the Roman magistrates of the time sought to intimidate him, to make him handover the Church’s treasure, he pointed to the poor of Rome as the true treasure of the Church. We can make St Lawrence’s gesture our own and say that you poor people really are the Church’s treasure. Pope Benedict XVI visits the Community of Sant’Egidio. 23 January: Putting Laudato Si’ into practice. I urge you to read the whole article through this link – changing hearts or changing habits? – and Laudato Si’ – and also to write to us through the comments box at the bottom of this page. I welcome contributions from followers and readers as well as our established writers. Please share your insights. If we receive comments I may collate them and use them in further posts about Laudato Si’. I look forward to hearing from you. Pope Benedict XVI wearing a pallium, and a mitre with the Good Shepherd and his sheep. Catholics will be familiar with Agnes’ name since she is mentioned in the First Eucharistic Prayer as one of the great early martyrs. She suffered death in her early teens. It seems unlikely that we would respect a modern teenager the way the Church has celebrated Agnes for 1700 years; perhaps we have something to learn from our ancestors! Agnes was from a noble family who were too prominent to avoid attention in the early fourth century persecutions. When she was arrested, she was steadfast in saying that she was a Christian. It is said that she was desired as a wife or mistress by one of the magistrates. No doubt this would have enabled her to escape execution, but she did not yield. She was to be burned alive but the wood would not light; instead, Saint Ambrose tells us, she was decapitated with a sword. There is a special tradition linked to Saint Agnes. On her feast day two lambs are brought from the Abbey of Tre Fontane to be blessed by the pope. When they are shorn later in Spring, the wool is woven by the Benedictine nuns of Saint Caecilia’s Abbey to make Palliums. These special collars are given to new Archbishops by the pope on the Feast of Saints Peter and Paul. Carrying lambs’ wool on the shoulder reminds the Archbishop that he is to be a good shepherd to his flock. October 15: CONSCIENCE VIII: Should we Beware of all Authority? Religious extremism, dictatorships, totalitarian systems, or simply capitulation to the moral values promulgated by the powerful voice of the mass media can desensitise our conscience. Our conscience needs to be alive and well, and able to evaluate and resist such voices. In saying that we need to be on our guard against dictatorships of all kinds, am I not saying that we need to be wary of all authority, even that of the Church? How do I know whether or not the teaching authority of the Church isn’t just another form of dictatorship? Joseph Ratzinger’s paper, ‘Conscience and Truth’ [reference, part VI], to which we have already referred in these posts, shows that our conscience holds the key to the answer. Let us return to what The Catechism says: in our conscience we ‘are alone with God whose voice echoes in [our] depths.’ Cardinal Ratzinger says that in our depths we have a mysterious “memory” of divine love. This “memory” makes us alive to the fact that behind the commandments, behind the law of God, behind the moral truths enjoined on us by the Church, lies a truth that exists for us not as an imposition from without but as an expression, even a liberation, of what is deepest within the soul. He says that this “memory” is not like the memory one might have of, say, one’s phone number, or the vocabulary of a foreign language. It is ‘not a conceptually articulated knowing, a store of retrievable contents.’ It is something much more profound. It is more like the knowledge of oneself that is awakened by a very deep human love. Human love can awaken the lover to a new depth of self-knowledge that both comes from the loved one and yet is experienced as a true aspect of oneself. In a similar but even more profound way, the ‘god-like constitution of our being’, as Joseph Ratzinger expresses it, gives us a capacity to “hear” on the level of our conscience the voice of God – a voice which is at once other and yet is experienced as one’s deepest, truest self. We say, “That’s it! That is what my nature points to and seeks.” There is a very real sense in which the truths that the Church proposes for belief liberate our true self and give us our deepest identity. But – and this is why the authority of the Church is not a dictatorship – we cannot discover this true self and deepest identity in isolation. Cardinal Ratzinger says that ‘The “memory” instilled in our being needs, one might say, assistance from without so that it can become aware of itself.’ This assistance is what the authority of the Church gives. It is in no way set in opposition to our deepest identity. Rather, it awakens it and affirms it. To grasp this is to grasp what the conscience is and is for.